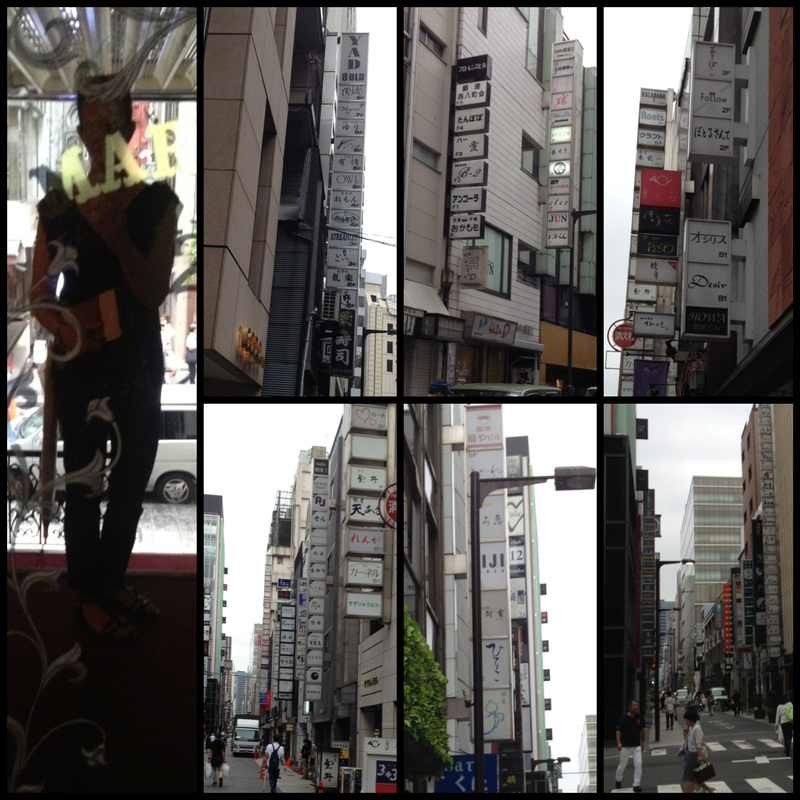 I went to Ginza today. Thought I’d check out my old stompin’ grounds and see if I could find the place I used to hostess at. Shocking I know…that I was a hostess, not that I was trying to find it. Not sure what the hostess scene is now but back in the day there were a few ways of being a hostess. Roppongi, Ginza or the Asian clubs. Obviously the Asian clubs were out for me. The girls there were mostly Japanese, Korean, Thai and Filipino. Interestingly they made the least money. If you worked in Roppongi in the dance clubs the hours were long and the base pay was lower than Ginza but you made GREAT tips if you could play the game…a whole lot of acting and schmoozing which means your customers ask for you at the door, they ask you to dance and they buy bottles of booze to leave at the club with their name on it. If you were involved in any of those transactions, you got a fee every time. If you were good at the game you could make $500-$1500/night. I knew this was not my scene as I had zero acting skills and would never be able to pull it off–also lots of drunken fools grabbing you. You’re not allowed to slap them. They would fire you. Then there was Ginza. A rabbit warren of clubs, that were literally the size of my kitchen, stacked on top of each other in the office buildings surrounding Ginza station.This is where I worked. The clubs were more like a private clubs…they were very small and had regular clients. You couldn’t get in to many of them (including mine) without an introduction. I got to know most of the clients very well. I even met some of their families and stayed in touch with a few of them. It was all very much on the up and up. When my mum came to Japan, they had her over for tea before the evening started. I made $500/night working from 7ish-11:45 (had to catch the last train home). I had to sit and make polite conversation if the clients wanted to or else just sit and look pretty. We had a strict dress code. They had to approve all our dresses. Close-toed shoes. Stockings. Nails done. Make-up and lipstick. No eating. No crossing your legs. No drinking. No smoking. Nothing remotely vulgar. It was like going to a Swiss finishing school. No one ever touched me or groped me. There were usually three of us. We all spoke a fair amount of Japanese but we never let on…so we could understand pretty much everything they said about us which was amusing. Hey it was boring just sitting there. We spoke bad French amongst ourselves so we could talk without anyone understanding us, though we had to be careful when they brought in European businessmen. Sometimes clients would take us out for sushi after the club closed but they had to take ALL of us including Mama-san and her daughter Mariko-san. They also had to drive us home afterwards or pay for a taxi or limo in addition to paying for our sushi, the cover charge for the restaurant (usually a few hundred dollars per person) and pay Mama-san for our time. This was back in the heyday of Japan before everything crapped out. I think I was there on the last gasp and I started to see some of the impending financial doom near the end of my time there which would have been the fall of 1991. But when I was there the saying was that if you took at $100 bill and crumpled it up as small as possible and dropped it on the ground, the tiny amount of space it covered would be worth $100 USD. Not sure if that’s still the case. There’s still a lot of money in Ginza if you look at the stores but it’s a bit run down. I’d be interested to know how the club scene is but not really sure how I’d find that out. My quest was unsuccessful. I wish I’d thought to read my journal and note down the instructions on how to get there for the job interview. I was hoping I’d have some sort of epiphany of recall when I got to Ginza station and I did a bit. I remember the Sony building and this weird bakery with cream puffs–Mama-san loved them and used to send ‘the boy’ out to get them whenever she wanted a treat. However, when I went down the back roads they all kind of look the same. There are tons of new stores too; it’s changed a lot since 1991. Also, I doubt they’re still in business…Mama-san would be close to ninety and Mariko would be in her 60s. It would have been cool to see it though…. thanks for sharing, that really does sound fascinating! Thanks for reading. It was a truly amazing experience and Japan is an incredible place.